Ireland has a diverse physical landscape of upland and lowland inland waters represented by 13,200 km of river and 12,000 lakes framed by an estimated 3171 km of coastline providing a range of freshwater ecosystem services. The quality and quantity of water flowing through Ireland’s inland and coastal waters are determined by the complex interaction of anthropogenic activities with soil and climate. It is the mosaic of soils that characterise the catchment draining a waterbody that regulates the flow of water through a catchment and the movement of nutrients and contaminants. 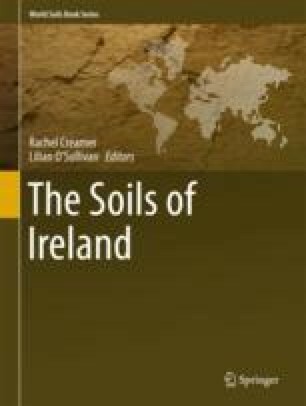 In this chapter, we describe the role of soil as the matrix through which, water and contaminants can be transported and retained within the Irish landscape, and the impacts on water quality in Ireland. Here we reference current water quality policies relating to diffuse of pollution from soils and describe processes and functions identified in Irish soils that influence nutrient and sediment transport to affect water quality in Ireland.